It was 2am and five tired bodies were hauling their bikes along a pitch black road somewhere near Durness in the far north of Scotland, followed by a morose procession of support vehicles. I do believe that Rickie Cotter actually hated me in that dark moment, but now that those grueling 36 hours and 518 miles are over she will tell you a different story. It’s a good thing that pain and discomfort are hard to retain in memory otherwise I’d have no friends left. When Emily Chappell and I first started sharing ideas that would eventually become The Adventure Syndicate, they were all about celebrating attributes commonly associated with women but in a context more often seen as male-dominated. In short, we wanted to show the world what groups of strong, enduring, co-operative, caring people could achieve together in a sporting context where aggression, strength and speed usually dominate. And what better way to launch this project that with an all-female non-stop team time trial around the North Coast 500? I’ll admit now I had no idea the can of worms I was opening when I began organising this thing. The logistics involved in keeping seven women and their bikes on the move using three support vehicles and eight crew are mind-boggling. Chuck into that a call to action to encourage other people to join us along the way and the commissioning of a film crew to document the journey and my brain was at full capacity. I had to get someone else to remind me to swallow and blink during the first two weeks of May. Emily took charge of social media leaving me free to plan on-the-ground logistics, but with food, vehicles, crew, roles, tactics, equipment, strategy, contingency, journalists, kit donations, SPOT trackers, pre-ride accommodation and film narratives left to consider, it’s little wonder that the night before the ride began, my bike was still in bits and I couldn’t find any shorts to wear. Fortunately The Adventure Syndicate had managed to recruit the most incredible team of experienced self-sufficient riders and creative, hard-working support crew imaginable. We assembled at my home in Inverness the Thursday evening before our scheduled 6am Saturday departure, to go over my fastidiously compiled eight-page document that detailed the roles and responsibilities of each rider and support crew member. Our goal was to get at least one rider round the entire 518 miles non-stop in 36 hours. Rickie Cotter (British 24-hour MTB champ), Joanne Thom & Zara Mair (Pedal Power’s endurance and adventure racing female pair) and Emily Chappell (Transcontinental racer and ultra-endurance cyclist) were put in the positions of protected riders. It was everyone else’s job to ensure these riders remained shielded from the wind at all times, had to make minimal decisions, were kept fuelled and hydrated and, at 4am when conversation would inevitably dry up, entertained with games and songs. In support of these four were a star cast of experienced bunch riders. Gaby Leveridge (Starley Pro cyclist) and Anne Ewing (my Team Scotland ally in 2014 Commonwealth Games) would assist me in organisng the group as they rode, ensuring lead riders never had to take a turn on the front, going back to the vehicles for food, water or clothing, and making sure that radio contact was maintained with the support crew throughout the night. Anne in typical style would arrive at 6am on Saturday still brushing her teeth straight off her shift as a Dr in the central belt. In support we had three teams in three vehicles. The Perfect View Productions film crew (Kirk and Lindsay) would be driven by David in the Big Tree camper van to set up shots and take drone footage of the riders. (Little did they know their camera equipment would soon be mixed in with our chamois cream and spare wheels, and that we would commandeer their driver to ride with us when we needed fresh conversation.) Team Life Support would be driven by members of the Torridon Mountain Rescue Team (Gordy and Tom) while our head of communications (Jenny) and our head of catering (Laura) would work tirelessly in the back of the vehicle to organise our regular and ever more random food requests (in the end they would just ask “sweet or savory?” and something would appear out of the window that we ate without noticing what it was). And then there was Team Bike Preservation, consisting of Pete and Fraser, whose job it was to keep bikes on the road and draft support riders back to the main bunch after pee stops or punctures. Once we encouraged Fraser to abandon his weekend plans of getting out and riding home from the west coast, he proved extremely useful in the dark hours before dawn when he joined us in our silent trudge across the north coast. It was with a mixture of relief and anticipation that we all eventually rolled out of Inverness at 6am on Saturday 14th May and started making our steady way west towards brightening skies. We whipped along as one big group, all politely not mentioning the significant side wind that we knew would be in our faces when we reached the sea at Applecross and turned north. Having agreed to a stopping strategy of five minutes every four hours to pee and refuel, I pulled my first mean trick of the ride by announcing there would be no scheduled stop until we had descended off the Bealach na Ba, after five hours of riding. 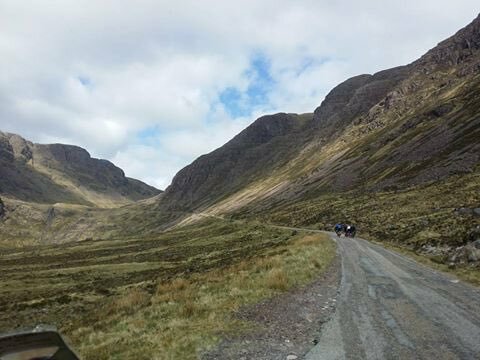 The climb up the formidable Bealach was a bit fast to be efficient over a 36-hour period but everyone was still so fresh and enjoying themselves so much that it seemed a shame to rein in their enthusiasm. We topped out all together under a now cloudless sky and sailed down to the blindingly blue sea. It was a wonderful feeling, descending at speeds of up to 40mph in the company of these women on this classic road, each of us utterly at ease and trusting of the fast, perfect line being taking in front of us. A five-minute resupply and pee stop while Gordy shouted out time checks and Pete and Fraser fiddled with my slipping gears, then Gaby and Anne peeled off to rest up for their later efforts, and the five remaining riders turned north into the headwind and began pressing on round the rolling coast to Sheildaig. Jenny and David have limited capacity for sitting in vehicles on sunny days and so it was lovely to have them by our side a few miles up the coast, their infectious enthusiasm buoying our spirits. As the Isle of Skye gradually slipped out of our peripheral vision, we wiggled our way up and over the coast road and into Glen Torridon. A brief respite from the wind up the sheltered glen before swinging north-west again along Loch Maree. By this time Team Life Preservation had picked up Tom from his home in Torridon and the radio evidence suggested they were having quite a nice time in the van. All the way up the relentless hill out of Dundonnell, they played us an unusual mix of what I think was supposed to be motivational music through the radio in my jersey pocket. Had we had the breath and the inclination we might have joined in their singing. On the long descent into Ullapool from the Braemore junction I knew I had to make a judgment call. I’d ridden 200 miles in support of our four lead riders and if I were to be of any use to them later in the ride I had to rest. I had a brief battle with my ego before giving myself a good talking to. The plan had always been to maximize our chances of getting one rider round the entire route non-stop in the fastest time possible. My staying on the bike now would not help achieve that collective goal, and would only give the remaining support riders more lead riders to protect during the dark hours that were to follow. 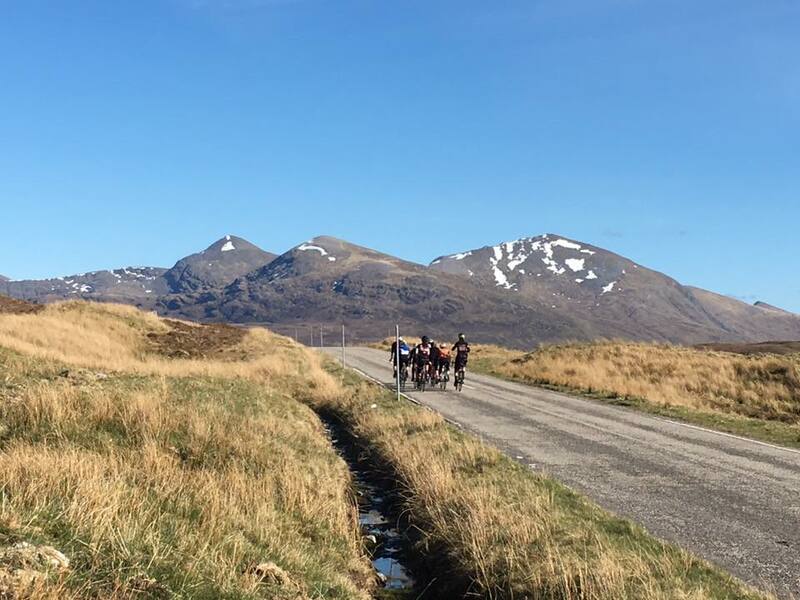 I had a brief check in with the four remaining riders who all expressed their keenness to carry on, before climbing off my bike in a bit of a grump in Ullapool. My grump was short-lived. Anne got back on her bike and I jumped into the Big Tree camper van with Kirk and Lindsay after a dinner of fish and chips and good chat by the sea. We were a full hour ahead of schedule. Forty minutes later I woke with a start. BANG. I jumped out of the van (remembering just in time to zip my clever drop seat shorts back up) to find all the riders in a heap on the tarmac just south of the Ledmore junction. The other riders all got to their feet but Emily stayed on the ground, in obvious shock with the pain she was experiencing in both knees. Eventually she recovered enough to communicate that she was OK, and the other riders and support vehicles got back on the road. We lifted Em into the camper where we discovered that the medicinal properties of Happy Bottom Bum Butter and cold chips work wonders on badly bruised knees and dented morale. Having buttered her up, we swaddled her in down sleeping bags and tucked her up for the night. A rider as strong as her would prove useful to the team in the morning if we could help her rest and recover enough to get back on her bike once it got light again. 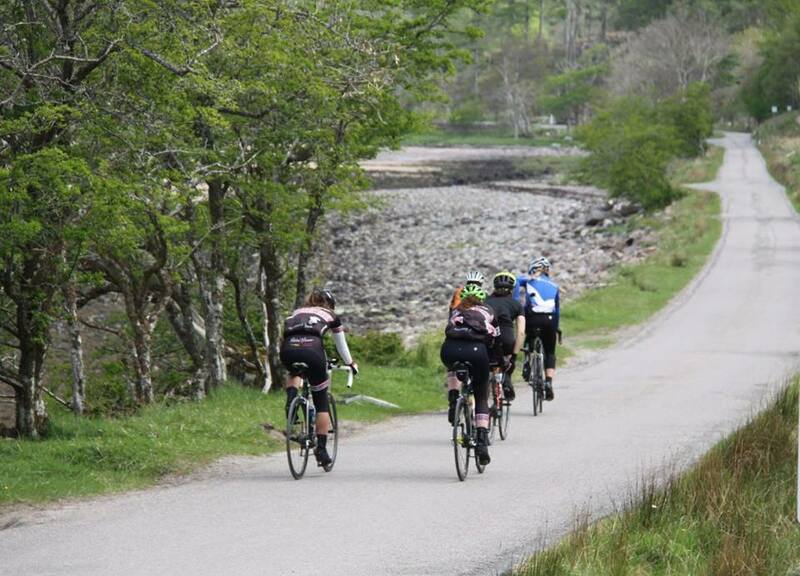 The remaining team rolled on into the evening round the Lochinver coastal road, led by Anne in the gathering darkness. Anne’s ability to keep tired disorganised riders together is second to none and all through the evening, while the rain tapped off the campervan windscreen, Jenny and I communicated with Anne, and Anne with our remaining lead riders Rickie, Zara and Jo. Gaby, meanwhile, had been recruited to drive Team Bike Preservation’s van while Pete got some sleep. This was the strength and depth of our team. A professional rider with the skill and experience of Gaby Leveridge was mucking in with whatever needed to be done to achieve our collective goal. At midnight, I wrestled the Bum Butter back from Emily and got back out on my bike. This was my watch: the witching hours. With 280 miles done and 250 left to go the last thing you want is for it to get colder and darker and to feel the night stretch out ahead of you, but I knew that if we got Rickie, Zara and Jo through this period and kept them on schedule we stood a good chance of achieving our goal. Still on time, Anne got in the van just beyond Durness to rest up for the final push home and the four of us turned east and crept on through the night. Although it was getting hard for the riders who had not stopped at all, spirits seemed pretty high after our five-minute 1am coffee stop. Our four lights bobbed about in the darkness while up ahead the tail lights of the Life Preservation vehicle gave us something to focus our dropping eyelids on. At some point we became aware of a strong silent presence behind us. Fraser had hopped out of the Bike Support vehicle and was tailing us like a guardian angel. He and I rode together at the front for a while, remembering the shortest day of last year when something close to insanity had inspired us, David, his partner Rachel and the effervescent Jenny to ride on frozen roads from Thurso to Lairg, by night. I’d like to point out now, that one was NOT my idea. We broke into Nina Simone’s ‘Feeling Good’ as the day gradually made itself known near Tongue and marveled as seeping light revealed the steep rocky coastline that we had heard the mighty sea crash into all night. At around 4am, Gordy pulled a van alongside us and Jenny’s tired but still smiling face appeared. Our friends in Bristol had stayed up all night watching our GPS unit inch its way around the coast. We reset the tracker and sang our thanks to Harriet at the other end of the country. Rickie remained solid throughout the night. When I dreamt this team up, Rickie immediately sprang to mind. This wee Welsh rocket has an incredible capacity to manage pain and discomfort, and a sense of humour, insight and understanding that makes you warm to, and want to work for her. I’ve never been happier to support another rider in my life. Jo and Zara are a phenomenal team. They have raced together so much that they instinctively know how to check in with each other to ensure they are eating and drinking enough and still operating their bikes safely. But while Rickie chirped away and I had to constantly tell her to get off the front and save energy by hanging onto my wheel, Zara and Jo went into a dark place. It was interesting to see how they both handled this. Jo, with her extensive experience of suffering like this, made clear demands. (“I need you to talk to me,” “Can we play a game?” “Come on Jo!”) Whereas Zara slipped further into the physical pain of her rebelling stomach. It was unfortunate timing that at the same moment Jenny and I calculated that our average speed had dropped so much that we were now 30 minutes behind our target. I took a risk by suggesting we speed up by 1mph in the hope this would change the girls’ emotional gear. It was kill or cure for Zara (she told me afterwards just how close she was to getting in that van right then) but as the hills gradually gave way to flatter terrain (“I don’t much like your hill, Betty” Cotter bellowed as we hauled ourselves through Bettyhill) Zara got back into her groove, showing incredible willpower, while Jo remained in her dark place almost to the end of the ride. This is impressive in itself. To carry on for 17 hours after first feeling down suggests a pretty tenacious disposition! One by one riders woke up and got back on their bikes until we found ourselves 10-strong having picked up some supporters along the way. We wheeled round John O’Groats before turning south at 10am. It now didn’t matter what state I got myself into. With so many strong, rested, experienced riders ready to take their turn in supporting the girls home, I decided to stay on my bike all the way to Inverness. We now had ‘just’ 120 miles to ride and we were home and dry. But the A9 is a horrible road to ride on. Busy and steep in sections, with a vicious westerly wind that whips off the flatlands and races to the sea. It was time for my darkest hour. The world twisted so that the road didn’t look real and I observed with removed interest how my body seemed to be refusing to do the simple things I asked it to. Now tucked away from the headwind while Gaby and a much-recovered Emily towed us south, aided by female support riders from Wick Wheelers and Thurso, I continued to keep a watchful eye on Rickie, Jo and Zara – but now instead of shielding them from the sidewind I blatantly ordered other people to. This was proving a nice little plan, and I tucked my tired body in behind Rickie so I could keep half an eye on her body language. Until she puked on me. It’s a thankless task being a support rider. We were back on schedule but our bodies were beginning to rebel. Our toilet breaks were becoming more frequent and we were back and forth between vans constantly as we tried to fuel our systems with anything we thought we could keep down. Golspie, Tain, Alness – we were now in familiar territory but we still had to hold it together for the final push. The riding was getting ragged and we were losing momentum. I got on the radio to work out our timings. Laura’s voice crackled back in answer. She had abandoned her sticky catering unit (which now looked more like a crime scene) and was working frantically on our timings. We had 60 minutes to cover the remaining 23 miles into Inverness if we wanted to hit our 36-hour target. This wouldn’t have been so hard on a normal Sunday run but we had hundreds of miles in our legs and little or no sleep. We were averaging 12mph. With a massive team effort we raised the pace through Beauly and tried to organise ourselves into an efficient peloton. There were some very experienced riders in the group but no one person calling the shots and with adrenaline running high now, things were starting to blow apart. Rickie was shouting for someone, anyone to lead her out and for a moment it looked as though she was going to be towed away from Zara and Jo to end up back in Inverness a solo victorious rider. Somehow, above all the crosswinds and frantic panic and ragged riding, Gaby, Anne and I ordered the key seven riders into a through-and-off formation (like that seen in professional team time trials but with more soiled clothing and bloodied knees). Together with Jenny, Paula and Fraser we managed to regain control and pinned the remaining eight miles into town at a speeds of nearly 30mph. As we approached the city limits I found it somewhere in my tired brain to take charge as the group started to fall apart again. She backed off the pace, stopped at the red light at Clachnaharry and allowed everyone to regroup. All seven riders finished the ride together in 36 hours and 30 seconds by my Garmin. I happily concede those 30 seconds to finishing as a group having all worked so tirelessly to achieve our joint aim. Now, looking back, I can’t quite believe we pulled it off. The dust has settled and so has my stomach and I am left with the feeling of having an invincible cloak around my shoulders. I am constantly surprised by what it is possible to achieve when a group of people share a common goal, compassion for each other, a willingness to co-operate and to compromise and to dig that bit deeper when the going gets really tough. The glow I am left with from this ride comes from the spirit under which it was taken up and executed. Every single member of our team was required to make sure we achieved our target and it’s so fitting that The Adventure Syndicate begins on these foundations. Thank you to Jenny, Laura, Gordy, Tom, Lindsey, Kirk, Pete, Fraser, David and the Pikes for your tireless support on the road. Thanks to all of you who came out in support and gave us encouragement online.